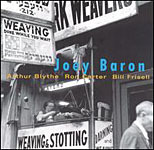 Drummer Joey Baron was born into a Jewish working class family in Richmond, Virginia. He is largely self-taught by means of watching others play and listening to recordings, radio and television. His early influences ran the gamut from Ed Sullivan show guests, to The Wild Wild West television show theme to records by Art Blakey, Ray Charles, Booker T. & the M.G. 's, James Brown, The Beatles and Jimi Hendrix. Besides being a member of the Bill Frisell Band for ten years until 1995, he has performed and recorded with an impressive list of musicians - including Carmen McRae, Dizzy Gillespie, Tony Bennett, Hampton Hawes, Chet Baker, Laurie Anderson, Art Pepper, Stan Getz, Lee Konitz, Joe Lovano, Vinicus Cantuaria, Jay McShann, David Bowie, The Los Angeles Philharmonic, Big Joe Turner, Philip Glass, John Abercrombie, Mel Lewis, Pat Martino, Harry Sweets Edison, David Sanborn, Al Jarreau, Jim Hall, Randy Brecker, Marian McPartland, John Scofield, Marc Johnson and The Lounge Lizards. Joey has lead his own trios one with John Medeski and Marc Ribot; and Barondown which featured Ellery Eskelin (saxophone) and Josh Roseman (trombone). Barondown recorded three albums - Crackshot (Avant), RAIsed Pleasure Dot (New World) and Tongue in Groove (JMT). He also co-lead the group Miniature (with Tim Berne and Hank Roberts) and was a member of Naked City (with John Zorn, Bill Frisell, Fred Frith and Wayne Horvitz) and of Zorn's group Masada (Dave Douglas and Greg Cohen). Joey's first release on the Songline / Tone Field series on Intuition was Down Home. The project featuresBaron's southern r&b-flavored original songs played by an all star band of Ron Carter, Arthur Blythe and Bill Frisell. The most intriguing ensemble of the season, (New Yorker) is not only all star, but fascinatingly so.(-Village Voice.) We'll Soon Find Out, the band's second album was released the summer of 2000. Both albums are produced by Lee Townsend. Baron's main performing band is Killer Joey, featuring guitarists Steve Cardenas and Brad Shepik as well as Tony Scherr on bass. They have a self-produced CD entitled Killer Joey with Shepik's predecessor, Adam Levy. Occasionally, Joey still performs with The Down Home Band in a solo setting, with Bill Frisell, Lee Konitz, Vinicius Cantuaria, John Abercrombie and in a trio with pianist John Taylor and Marc Johnson on bass. All About Jazz musician pages are maintained by musicians, publicists and trusted members like you. Interested? 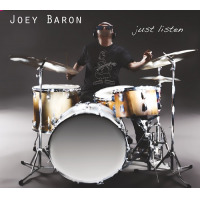 Tell us why you would like to improve the Joey Baron musician page.